HIGH QUALITY: Made of high quality quartz crystal material, very durable and stable to use. FUNCTION: It provides a stable signal for integrated circuits and it stabilizes the frequencies of radio transmitters and receivers. EASY TO USE: This set is organized by size in a transparent storage case for quick access and protection. 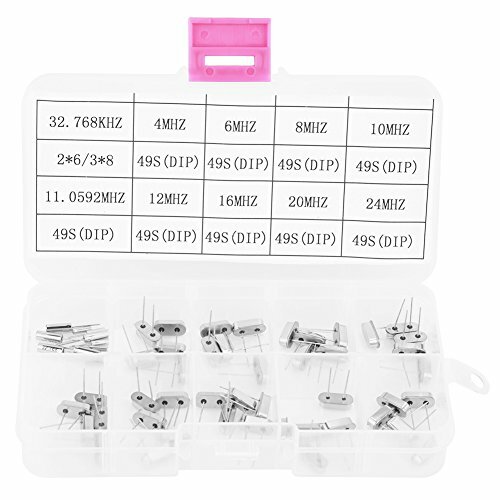 MEET YOUR DIFFERENT NEEDS: There are 11 Value 32.768KHz-24MHz Oscillators to meet your various needs. APPLICAITON: Widely used in TV, automobile electronics, pc cards, electronic meter, DVD, MP3, MP4, etc.